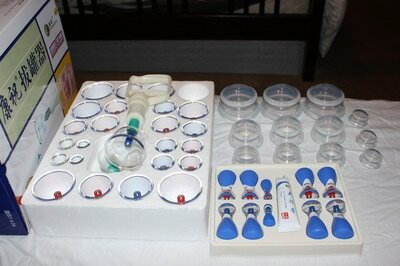 An ancient technique, Cupping is the oldest and most globally practiced medical treatment in human history. Cupping Massage is a modified version of the common practice of Cupping Therapy, used in traditional Chinese medicine and the results that this treatment produces are impressive. The therapeutic applications of cupping have been documented through several thousand years of clinical experience. 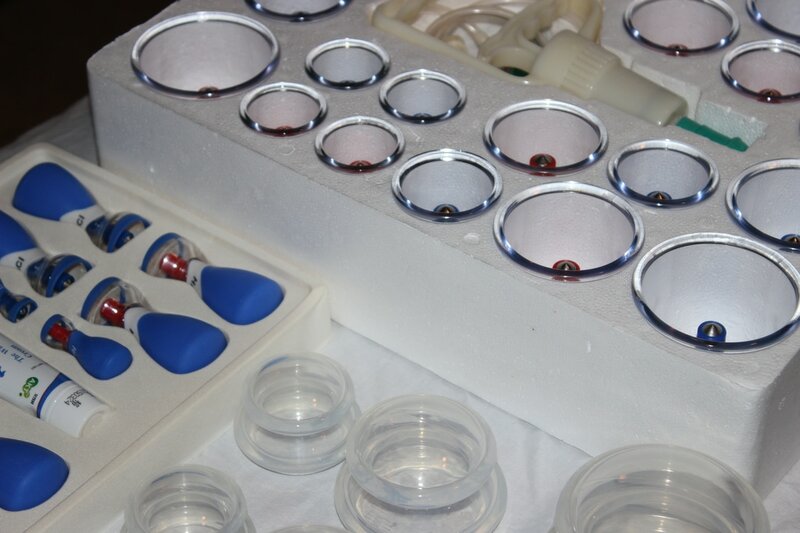 Cupping is used extensively in Chinese Medicine and has now been safely adapted to use in massage therapy. 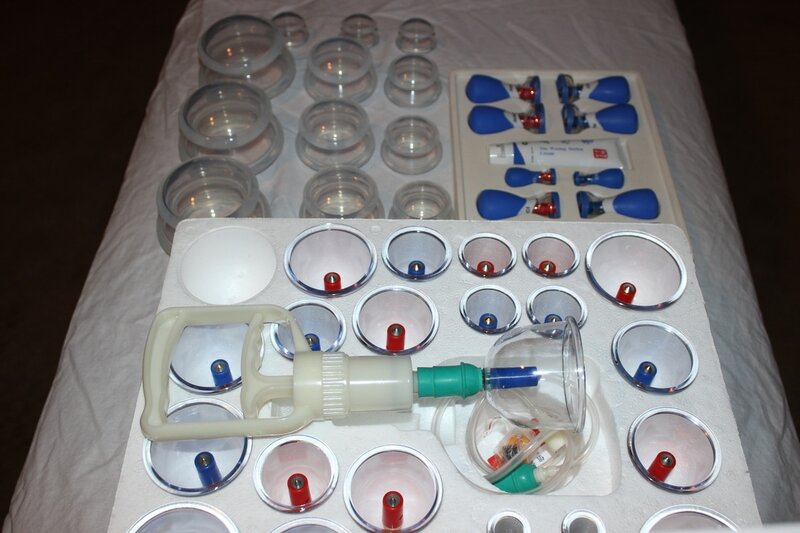 Cupping is a technique whereby a vacuum is created in a cup, drawing the skin up into the cup and separating the layers of skin, muscle and fascia. The suction draws the blood to the level of the skin, creating a vacuum below the skin, mechanically separating the tissue layers which destroys old blood vessels and creates new ones. Client will most likely be left with a mark from the cupping that will look like a bruise but it isn’t. No breaks in the skin are created and it is a perfectly safe and sterile procedure. Blood is drawn between the skin layers and can last for up to two weeks. When the cup is left on the skin for a few minutes, blood stasis is formed and localized healing takes place. The suction and negative pressure of the cups rapidly provides rigid soft tissue release by loosening and lifting connective tissue. This release of tissue breaks up and drains stagnant tissue fluid while increasing blood flow and lymph flow to the skin and muscles. The pulling action of the cups also engages the parasympathetic nervous system, which allows for deep relaxation of the mind and body. What are the discolorations that sometimes occur during treatments? The most common and unfortunate misconception concerning Cupping is the misinterpretation of the marks sometimes resulting from the treatment. THESE DISCOLORATIONS ARE NOT BRUISES. When injuries occur deep in the muscle, bleeding often occurs from breakage of the capillaries. There is no compression in cupping therapy and therefore no bruise. The discolorations are more like a hickey. When a condition exists where sufficient pathologic factors and stagnant fluids are present and a vacuum is applied to the area, a discoloration will appear on the skin as the stagnation is brought up to the surface. This is the therapeutically desired effect. Healthy tissue does not discolor. 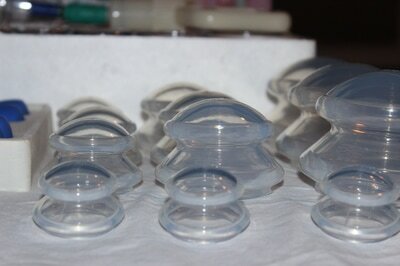 Massage cupping is not an irritant to the skin or body. It draws the inflammation out, it does not add to it. What are some benefits of Cupping? Accelerates healing of injured muscles. ​A favorite area for massage cupping is on the broad area of the back. Larger cups are used for this, and a strong vacuum will mimic the rolling action of deep-tissue massage without any discomfort. The movement may be long and intended to drain fluid, or circular and stimulating for stubborn knots and areas of rigid tissue. The skin will turn red with strong massage cupping, indicating that circulation has been brought to the surface.